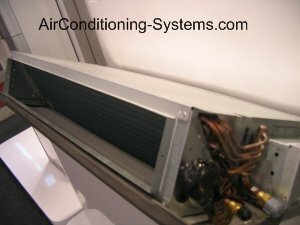 The direct expansion system in HVAC has been growing rapidly due to its ability to get rid of most duct work and piping. The popularity of this system is because the installation work has been made easier hence reducing the cost of the overall system. The DX System works in such a way that the evaporator is located in the space to be refrigerated. When the refrigerant in the evaporator coil expanded, it will cool the space by absorbing the heat from it. 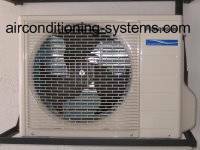 The mini splits, window air conditioner and packaged units are examples of such system. Ease to test, adjust and balance the system. Minimum ceiling or wall space needed. Individual section can be operated without running the entire system in the building. Comfort under varying load conditions. Low noise level (NC 35). The diagram above shows a cooling cycle of a heat pump DX system. The valve used is a reversing valve that reverses the refrigerant flow to enable the heat pump to run cooling or heating. 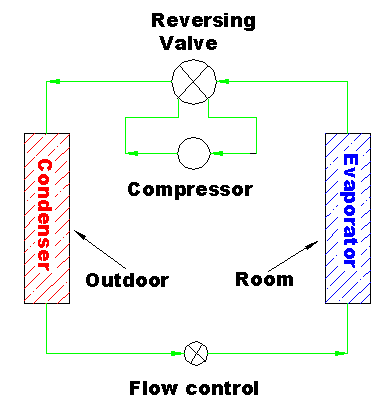 A normal valve is used when a cooling only system is needed. 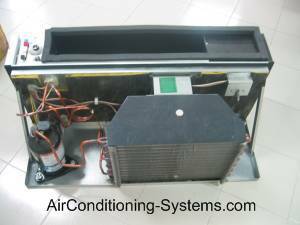 This type of system is also known as the vapor compression systems. Here are the refrigeration cycle of a direct expansion system. The expansion of the liquid refrigerant is handled by the flow control device which can be thermal expansion valve(TXV) or capillary tube. 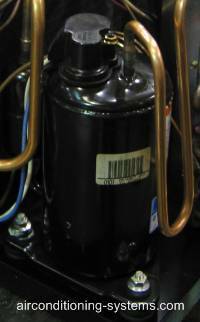 The receiver is located after the compressor where the high pressure and high temperature liquid refrigerant is stored. This liquid flows from the receiver through the liquid line to the refrigerant flow control. The liquid high pressure is then reduced to the evaporator pressure as it passes through the flow control. This is so that the saturation temperature of the refrigerant that enters the evaporator will be lower than the refrigerated space. As the liquid passes through the flow control, a portion of the liquid vaporizes to reduce the liquid temperature to the evaporating temperature. The liquid vaporizes at a constant temperature and pressure in the evaporator coil. This happens as the heat to supply the latent heat of vaporization passes from the refrigerated space though the walls of the evaporator to the vaporizing liquid. The refrigerant is 100% vaporized inside the evaporator after which it is super-heated at the ending stage of the evaporator. The pressure of the vapor does not change. The moisture from the air is also removed as the moisture condenses on the evaporator coil. The water will drip down into the condensate pan located underneath the coil. The water is then discharged to the drain by connecting a hose or piping to the pan. If discharge by gravity is not possible due to the constraint in installation, a condensate pump is used to pump the water to the drain. In this way, humidity is removed from the room. The compressor will draw the vapor from the evaporator through the suction line into the suction inlet of the compressor. The vapor is compressed in the compressor causing it to rise in temperature and pressure. The vapor is then discharged from the compressor into the discharge line which then goes into the condenser coil. The vapor then flows into the condenser where heat is transferred to the cool air that is drawn into the surface of the condenser coil by the condenser fan. When this happens, the temperature of the vapor drops to the new saturation temperature corresponding to its new pressure. The vapor condenses into liquid state as more heat is removed from it. When the vapor leaves the condenser coil, all the vapor would has been condensed and further sub-cooled. The sub-cooled liquid then goes into the receiver and is ready to be circulated again. The function of the receiver is to store the liquid refrigerant to ensure that a constant supply of liquid is available to the evaporator.